Members of the The Third Grade Recycle Team Showing what they got! They collected 2,303.61 pounds of paper this year! Our school recycled___105 pounds__ of paper this week! Congratulations, keep up the great work! Keep recycleing and try to bring the total up more! 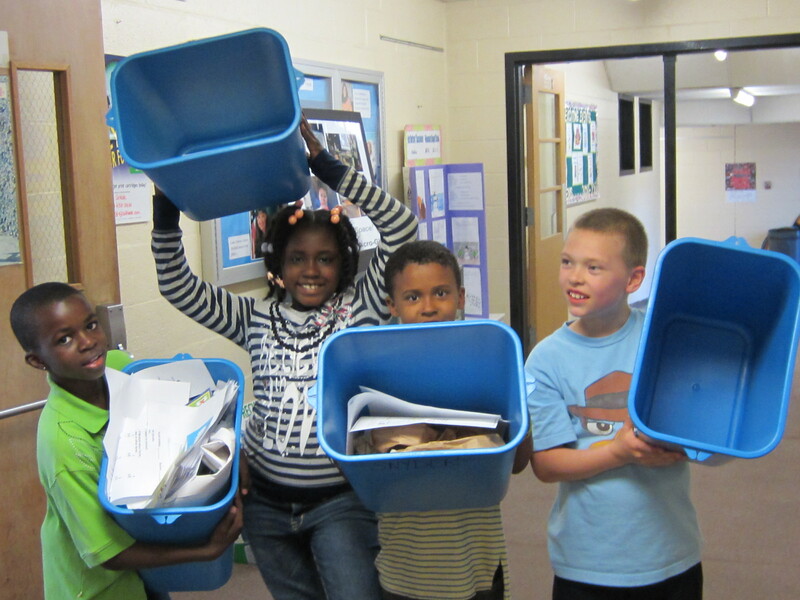 Our school recycled 111 pounds of paper last week! Our school record was 109 pounds in one week! We have broken our school record! TOTAL FOR THE SCHOOL YEAR IS: 2,303.61 POUNDS OF PAPER! Use both sides of all paper. Put your paper in the recycle bin! Help us save the earth! Have a Great Summer! Well, we are at the end of the school year for the 3rd Grade Recycling Team. I commend your efforts in keeping a recycling tradition intact. This month, We will need to tally our weeks and months to see if we have beaten the record of weekly paper collected: 109pounds, and tally a grand total for the school year that I will post in our school newsletter for all to read! What will it be?????? You came close, at 104 pounds in December, lets get our totals logged, you may have already beaten it and do not even know it! REDUCE, REUSE, RECYCLE! SAVE THE EARTH! We noticed that our school collected a lot less paper during the year. This year we will try to beat the school record of 109 pounds! We will inspire people to recycle! So how many pounds of paper have you recycled to date? Have you broken the school record of 109 pds. in 1 week yet? Keep up the great work, making our world a better, cleaner, GREENER place to live!